First things first, Happy Belated Birthday to my dearest blogger friend Lush Angel and to Mr. Fred Penales of Hairshaft Salon! 2 years ago, I had a hair treatment that took me hours (story HERE) and good friend Angela visited me as she lives close by and a quick chat turned into hours of fun memories! (with Mr. AMW sleeping at the background). From then on, we knew we are best salon buddies! And I got pregnant, gave birth and the rest was history! Because Angela enjoyed my company so much! *laughs* (This is my blog, walang hihirit hahaha) She invited me to have another "salon date" with her at Hairshaft salon (her favorite salon) at Podium. Because of the location, the long-overdue salon date didn't happen until that fateful day when we both attended Burt's Bees 30th Birthday event and both of our cars are coding and we'd rather spend hours pampering inside a salon! Let's talk about Hairshaft Salon, I heard about Hairshaft way back when I used to work at Ortigas area. My colleague always have good hair day and when asked about where she usually have her hair cut, the answer is always Hairshaft Salon, Podium! So can you imagine the excitement of me finally meeting the "GODFATHER" Fred? Owner of Hairshaft Salon? A group shot prior to our hair-makeover! "groufie c/o Samsung NX Mini"
Now let's talk about the salon itself! Upon entering the salon, on a weekday, you would be surprised to see the salon almost full! Angela told me this is the first time she saw the salon not that crowded. I mean seriously? On a weekday? Everyone's busy but you can definitely feel the air of excitement and friendliness! For a salon that's well-known for its' craft, everyone's very friendly, courteous and relaxed! The size of the salon isn't big or small, just right to accommodate at least 10-12 clients comfortably at the same time! The salon has the ambiance of a "construction" site, nothing negative, but you know the feeling of an area that seems "undone" but actually done with flair? That's the feeling I get inside the salon. Everyone's busy chatting and laughing and I can sense most of the customers are return customers! Men and women alike are comfortable sitting inside as they choose their much awaited hair session! Now back to our hair treatment! Angela chose to have her regrowth colored while me, who originally thought of going for a simple haircut was advised to go for hair treatment and Brazilian Blowout, because..self-explanatory! My hair is a mess! The treatment took around an hour and the Brazilian Blowout itself is around an hour plus. What I noticed about their staffs is how they handle each treatment professionally. It was a first for me to try Brazilian Blowout and I was amazed how different the treatment was as compared to rebond (I used to think they are the same). A Keratin treatment was sprayed on each layer of your hair. Each section will be "blow-dried" to create the "volume". No hair-washing for at least a day. Limp hair will have more volume even after washing your hair. The treatment time is shorter than rebond. Hair feels soft and smooth immediately after the treatment. After shampoo, even without blow-drying my hair, my hair feels "fuller" and almost no tangle. My hair color appears more vibrant. Fred also fixed my layers with a quick haircut using "dry cut" method! I love it that my layers are more obvious now! And of course, after every Hairshaft royalty treatment, you get to take fun photos with the wonderful Hairshaft staffs! Cheers to Miguel and Fred for taking care of me! I am definitely happy to be #MIGUELIZED and #FREDIFIED! 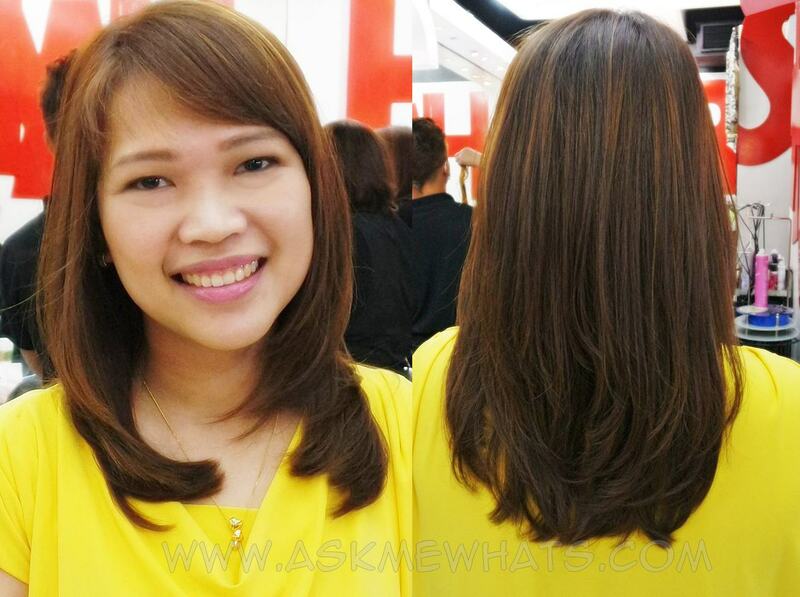 Brazilian Blowout costs around Php7,500 (for long hair), less if you have short hair. Hair treatment starts around Php1,000. Haircut from senior stylist for women is around Php1,000. Overall, Hairshaft salon is definitely a salon worth visiting at least once in your life! They give you impeccable service and they definitely know what they are doing! Some of the services are more expensive than other salons but it is because they use high grade/quality hair products. I strongly suggest you have your hair "quoted" before you proceed with your desired services. It may be best if you let them know your budget as well! Thanks Fred , Miguel and the rest of the Hairshaft Podium team for taking care of me! I will definitely go back! Thanks Angela for recommending me this wonderful salon! Have you heard about Brazilian Blowout?